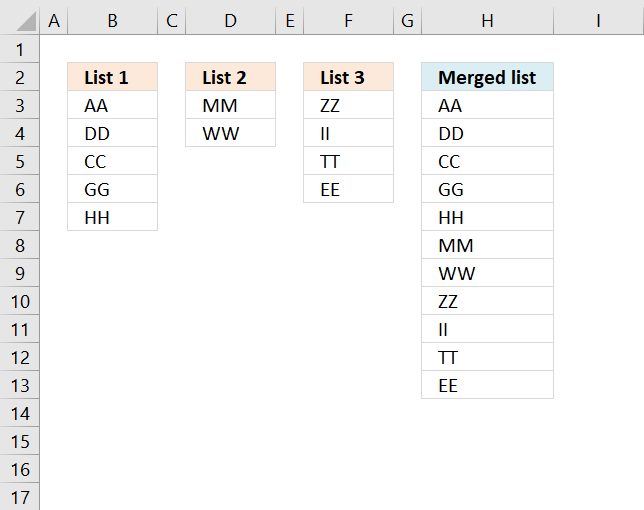 Merge Ranges is an add-in for Excel that lets you easily merge multiple ranges into one master sheet. 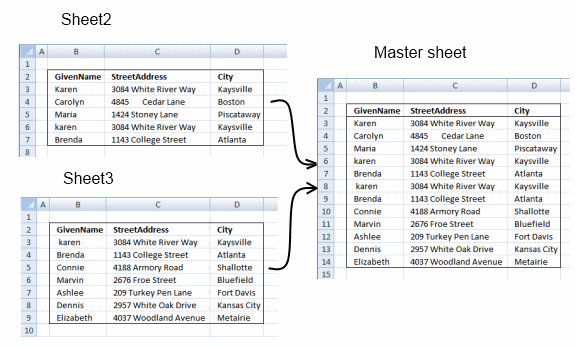 The Master sheet is instantly refreshed if the data in one of original sheets changes. Once the formula is entered in a workbook, it works automatically without user interaction. Possible to merge up to 255 different ranges. In this example there are four sheets. Master sheet and three sheets to be merged. Sheet 2,3 and 4 contains data about people (Fake randomly generated data). The ranges also have some blank records. Click to expand. Master sheet contains all data from all three ranges merged into one list. Nothing is removed except blank records. 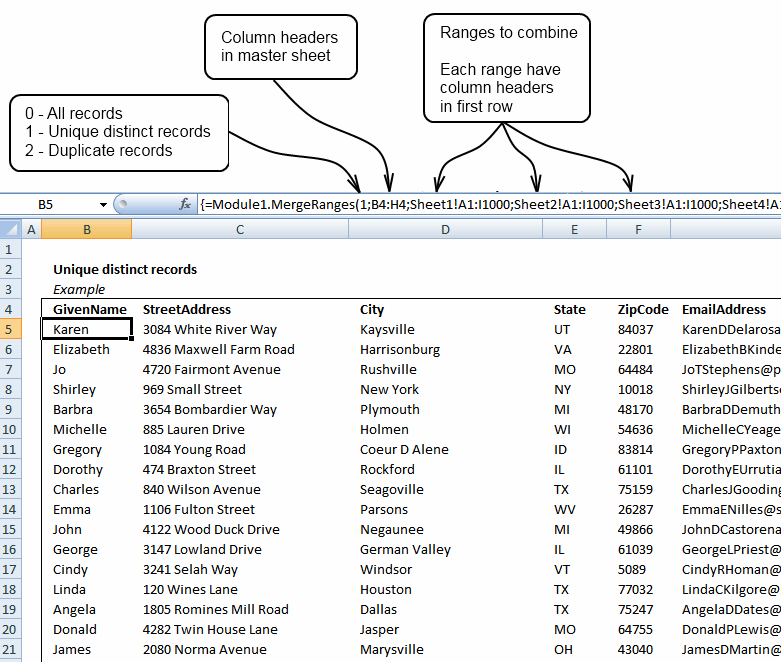 Column headers in master sheet rearranges columns automatically. Compare above picture with picture below and see how the order of column headers can be changed in any way you like. range1, range2, ... are cell references to cell ranges to merge. Each cell range have column headers in first row. There can be as many as 255 cell references. Master sheet contains unique distinct records from all three ranges merged into one list. Nothing is removed except blank records. 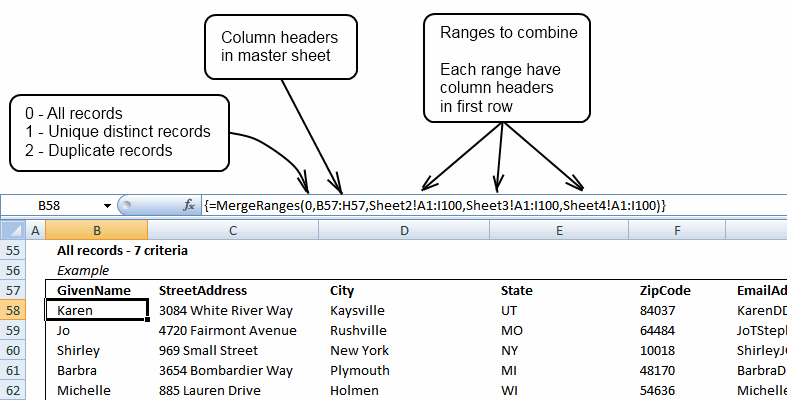 Column headers in master sheet rearranges columns automatically. Compare above picture with picture below and see how the order of column headers can be changed in any way you like. Sheet 2,3 and 4 contains data about people. (Fake randomly generated data). The ranges have column headers in first row (requirement). There are also some blank records. The Merge Ranges Add-in found one duplicate record from all three ranges combined. 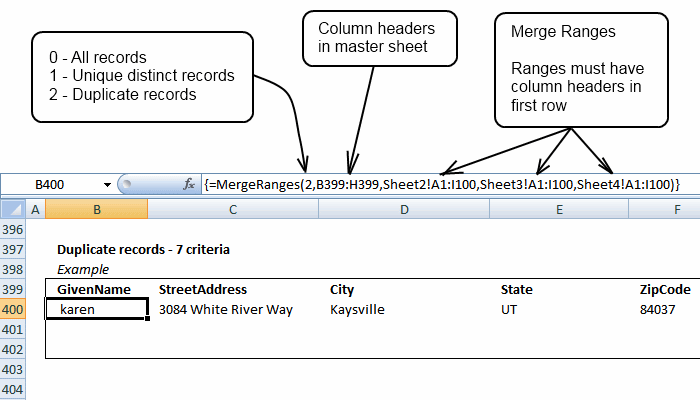 Merge Ranges Add-in for Excel 2007/2010/2013 *.xlam file. Do column headers in master sheet need to be arranged in the same way as column headers in other sheets/ranges? No, you can rearrange column headers as you like. A requirement is that they have identical spelling (not case sensitive). Do I need to have as many column headers in master sheet as in the other ranges? No, you can have fewer column headers in your master sheet, if you like. How do I enter this user defined function? It is an array formula. No, it is locked for viewing but you can buy VBA source file for $10 more. After you finish payment, you are redirected to the download page. You will also receive an email with the download link. You have five attempts to download the file. The download link will expire in 120 hours (5 days). If you can´t downloading the file, contact me. It looks like you are assuming that everyone knows that this technique can return the # of unique data entries from a real 3D range. I am pretty sure that no one has ever done this before, so congratulations! I have multiple worksheets in a workbook. Each worksheets is project specific. Each worksheet contains almost identical format. The columns I am interested in each workshets are "Date Plan", "Date Compelted" and "variance" and "Project Code"
I then want data from all these column to be extracted in a Report worksheet and later want to do a trend chart by sorting all dates in chronological order. Key bit to start is how do I get data out from worksheets. Esentially I want all the data without any loss. There are chances that some of the data between worksheet1 & 2 could be identical, apart from project code. Also, preference is that this coding or formula should work for any future addition to worksheet data and workbook worksheets. I am not sure if I manage to explain everything very clearly. Please do not hesitate to email me if you need more clarification. I´ll post an answer as soon as I can. say if I ask to search for January data then I am expecting January data from all work sheet to be extracted and copied in my Report worksheet. I can then have 12 X 4 ( For Key Columns - date plan / completed / variance and project code) different columns with all monthly data from various worksheet. First of all id like to thank you for your blog. I have found many very usefull tips and answers, but still i have one problem that i cant solve by my self. So im asking for your help. Lets say i have a cell with number 3. I need to find a number in column A that has a number >= than 3, but also has the smallest number in column B. Simple vlookup gives me first >= number, but in most cases in column B is not the smalest number. I think I can solve your problem using vba. I hope I can post a solution here soon. Thanks a lot Oscar! You are genius! Thanks again! hi..i have been working on my problem for quite sometime now...i wud b very thankful if u cud provide me the solution. problem: i have created a workbook containing 12 sheets each corresponding to a month. each sheet has 3 fields-region,premium, claims and ICR. Mow i want to consolidate this data using drop down menus such that wen i select say january month from the drop down, january months data for all the regions shoud be dsiplayed ans similarly for all other months. in addition region should also be in a drop down i.e. wen viewing the data for a particular month, i could select a region and then view its data. Is is possible to get this work with ID-names not numbers? Here: "Create a sorted unique distinct list of numbers originating from multiple sheets"
Lets say if i have the id's like ALFA, BETA, GAMMA, DELTA etc. 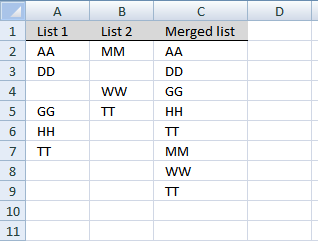 is it possible to collect all these unique names and combine some data from their rows and sheets? I assume the function small doesn't work anymore? As far as I know using formulas, no! But maybe pivot tables can solve your problem? Same logic i need to be use , but there is the problem when my id nos are more then the No.of row values i.e in excel 2007 total no of row is 1048575 , but hear my id value is more then rowno value i.e 5505982 so that i am not able to get the output . can you plz sugest .. I never thought row function created numerical limits. 1 to 1048575. I´ll comment here as soon as I have an answer. 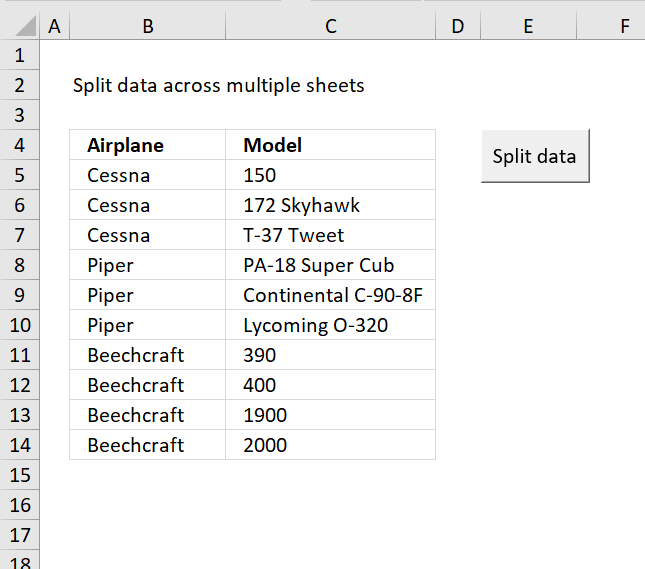 I have a question about merging two excel worksheets into one masterfile. I have a first worksheet with daily stock price data for hundreds of firms over a couple of years (panel data). I have the following columns: Firm Number, Date and stock price. Now I have a second worksheet containing accounting data for the same firms over the same years. Since the accounting data is yearly data, this sheet has less observations. The columns I have in this sheet are: Firm number, Date,Fiscal Year, FiscalYear end month and a few accounting variables. Now, I want to add in the columns next to the daily stock market data the accounting variables for that specific fiscalyear. I have a row with stock price of firm #1 at 27-12-2010. The accounting worksheet shows that the fiscal-year of firm #1 ends on 31-09-2010, so first I have in someway to determine in the daily stock price file that 31-12-2010 is fiscalyear 2011 for firm #1 and consequently, in the columns next to the stock price per 27-12-2010 I want to add the accounting variables of firm #1 in fiscal-year 2011. Hi Oscar, i hope you can help. i have a workbook consisting of several sheets. each sheet depicts data for several critera related to that specific sheet (the row fields are the same across each sheet) which is further broken down into categories specific for that area. in the summary sheet which also share the same rows i should be able to select a category (from a dropdown) which will give me a summary of those fields in each category. areas might overlap in town sheets. the summary sheet - i wish to see how many apples, pears, oranges was sold in a specific area across all the towns. if i select say 'area 2' in the area dropdown, it will search across the sheets and display the totals of each of the items sold for area 2. I need to consolidate some excel workbook into one to make a master list.and i also want to have duplicate to identify on that master sheet,you think you can help me? You worksheet is awesome but when I type 29 or above numbers in ID it shows error. Yes, upload an example workbook. You are genius Oscar. I was trying vlookup but didn't get it to do what i wanted. You just wowed me. God bless you. Thanks you so so much for being there. This method does NOT work... Unless I am completely missing something. 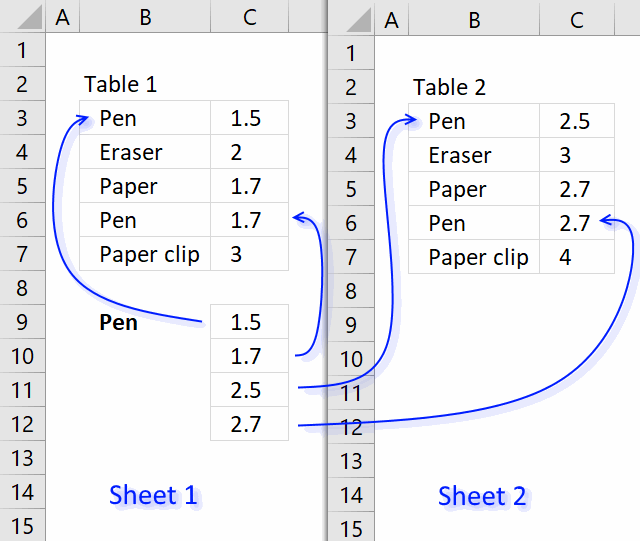 I am referring to the first method listed with all basic excel formulas. You find the max IDs as 28 in a formula and then you just manually type that in to your unique list step? What? This is only useful for finding a unique list of a never changing table as even tested in your example if I simply add an extra value to one of your tabs your entire sheet dies. I am working in Manpower Company. i want a unique sheet that collect automatically and plus all the data in separate sheet so i can easily maintain all my data.Please Help me if its possible. Can not tell you how much your site has helped me. I know this is an older post, but I am stuck and would imagine some others could have this question. 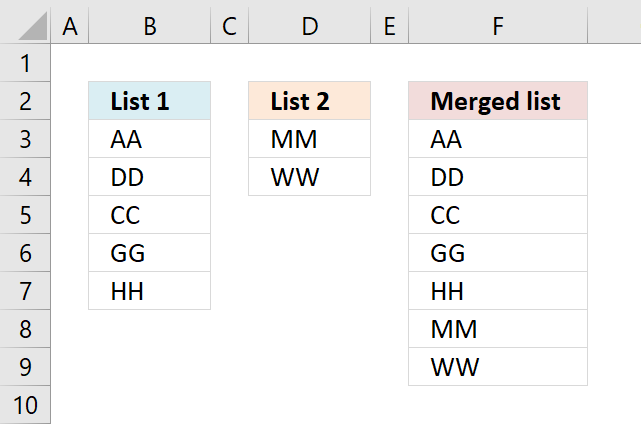 I am wondering if there is a way to use the formula you created to "sort unique distinct list of numbers originating from multiple sheets" while also filtering for multiple conditions? So imagine if in the example you gave not only is there an ID number but also a column with product code, a column with territory ID, and a column with the date of the transaction. I want this formula to return the ID number that matches 3 different criteria pertaining to those 3 columns, across multiple sheets, and only allowing unique values. Thank you for all your help in excel! 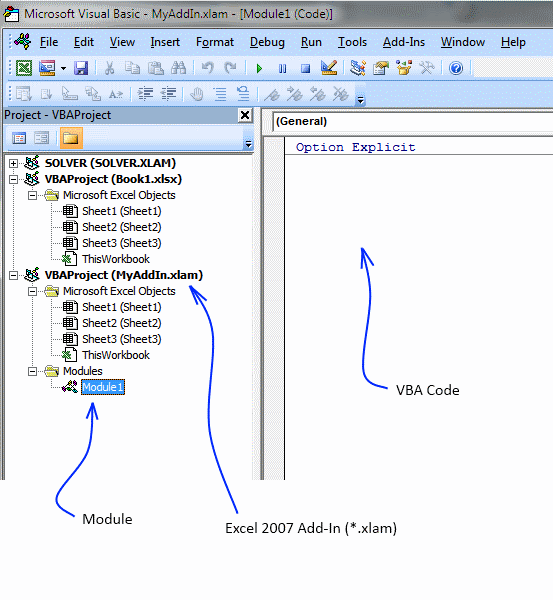 I don´t think it is possible, you need a user defined function (vba).